Sterling opened the scoring from Jadon Sancho's cross in the 23rd minute and Harry Kane's penalty put England in complete control on the stroke of half-time. Bulgaria midfielder Todor Nedelev scored a dubious late penalty to help them earn a 1-1 home draw in their opening Euro 2020 Group A qualifier against Montenegro on Friday. 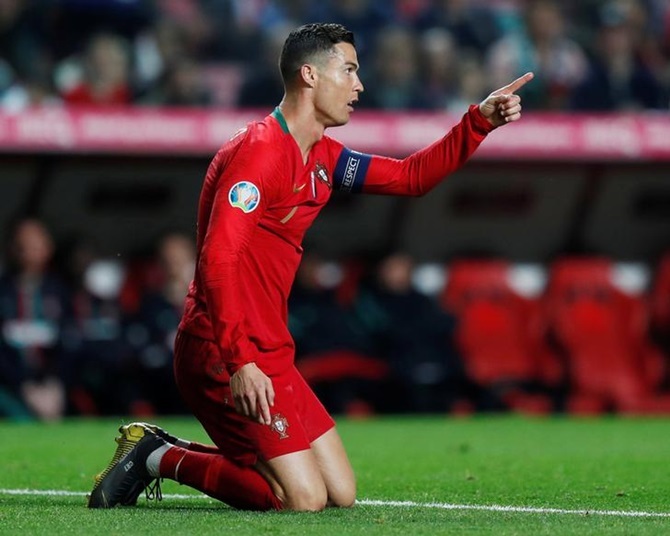 The penalty was awarded in the 82nd minute for a foul by Montenegro substitute Vladimir Jovovic on Stanislav Kostov but television replays showed the incident happened outside the penalty area. Stefan Mugosa opened the scoring when he curled in a brilliant left-foot shot five minutes after the break that gave Bulgaria keeper Nikolay Mihaylov no chance having beaten Vasil Bozhikov and Petar Zanev by putting the ball through their legs. Bulgaria were unable to get into their stride for most of the second half but 17-year-old debutant Martin Minchev almost secured a late win when he shot just wide. Bulgaria visit Kosovo on Monday when Montenegro will host England. Gareth Southgate's side face CzechRepublic later on Friday.